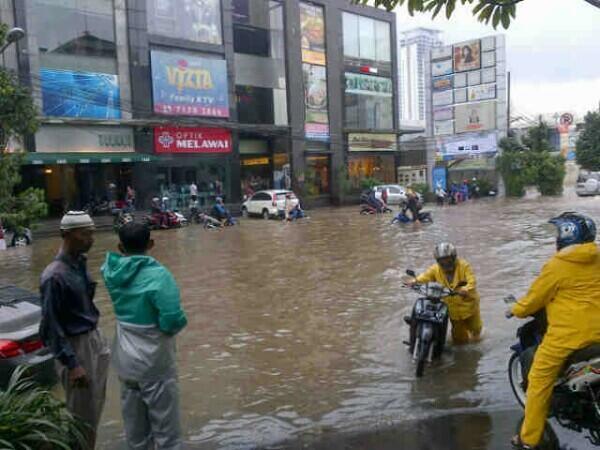 When it rains, it pours; in Jakarta, it floods. Last night I awoke to a familiar sound from our bathroom: drip … drip … drip. I was surprised that I could hear it over the pummeling of rain on our roof. Whenever it rains — right now, almost daily — water streams from the edge where the bathroom wall meets the ceiling, and the crown molding is, well, moldy. This is a leak that can’t be fixed; workmen have tried four times. They managed to repair a more significant leak in our bedroom ceiling, but the bathroom is somehow unfixable, especially now that the rains are under way. Stemming from a failure of forethought in the construction of the building, it is like a metaphor for Jakarta. Every year the rainy season comes. Every year the city is made lame as the banks of the rivers that empty into Jakarta Bay overflow, bringing mud into the homes of those who cannot afford to live on higher ground. No one escapes the effects of the rain. Shoddy drainage systems cause the streets to flood, and traffic comes to a standstill, as somewhere miles down the line, cars are getting stuck in puddles a few feet deep. But the flooding can’t be stopped. It is caused by fundamental failures in the structure of this city. They are lucky because they can afford help. Our driver’s street floods regularly. He and his wife are glad to live on the second floor of a two-story house, but his motorcycle — his only personal transport — is subject to whatever the weather brings. He often has engine trouble because he cannot keep the bike on high-enough ground. Many of his neighbors have had to leave their homes periodically. Official figures of displaced persons fluctuate; Jakarta’s disaster management agency’s reports show 40,000 displaced on some days, 70,000 on others, but it is safe to assume that more than 100,000 people have been displaced to shelters. Other reports say as many as 250,000 have been affected. The politicians (like the workmen at our house) promise that they are fixing this failure. But their projects mostly amount to Band-Aids. The truth is, Jakarta is overdeveloped; as a result, too much of the city is covered in “non-permeable surfaces” — in other words it’s all pavement and buildings, lacking in proper drainage. As the World Bank reported, many of the water catchment areas, i.e. green spaces, have all been “developed.” On top of that, a lack of maintenance and a lack of waste management have caused Jakarta’s canals and rivers to be perennially blocked by debris and garbage. Major projects are being undertaken to dredge rivers and canals; more canals are being built with floodgates. The World Bank invested US$ 140 million in 2012 (three times the country’s own financial commitment) to begin a series of projects to reduce flooding (to be completed by 2017). Sadly, after decades of poor management and with major construction still ongoing city-wide, Jakartans still live under threat. When it rains, the water rises and, every few days, parts of the city flood again. Since prevention is failing, all that is left is to respond and repair. The city is relatively accustomed to responding. The disaster agencies set up shelters (around 70 this year) and distribute food (mostly instant noodles) for those who have been displaced from their homes. They rescue stranded residents with small boats. 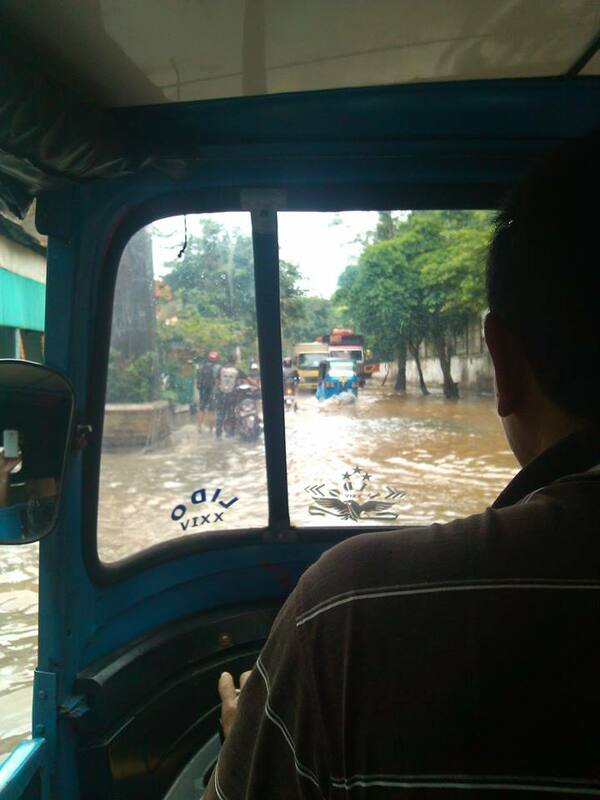 The flooding wreaks havoc on Jakarta’s already feeble infrastructure. According to the Jakarta Globe, about 3,903 road sites need repairs due to the flooding. Mostly these are potholes, and some are larger eroded sections. The Jakarta Public Works Agency has committed to repairing all of these in one week. Though this sounds like an impressive commitment, the agency explained that if high-quality concrete cannot be used, it will “fix the road temporarily with asphalt.” This does not bode well for the ability of Jakarta roads to withstand next year’s rainy season. Economic damages are estimated at over US$ 4 million so far this year, and in the long term, losses are larger. Not only homes and businesses suffer, but the city’s budget is strained by the costs of response and repairs. When the problems run as deep as Jakarta’s, they are difficult to fix or reverse. 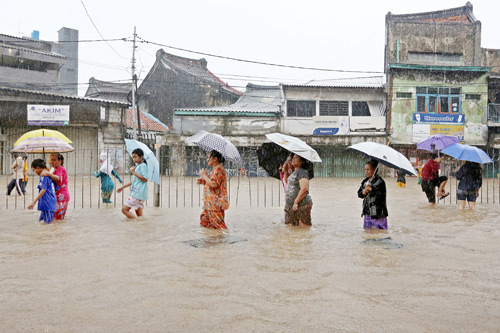 Major public works such as those being supported by the World Bank may help reduce flooding over the coming years. Stronger enforcement is needed for building codes, and better planning is a must. In the long run, Jakarta may undergo a complete overhaul of urban planning, one that would bring forethought to the structure of the city. For now most Jakartans can only hope. This entry was posted in Indonesia, Nature, the environment & landscapes and tagged infrastructure, Jakarta floods, public works, rainy season, Traffic, world bank. Bookmark the permalink.